This comprehensive history of India, from ancient to modern times, presents an alternative, even iconoclastic, view. 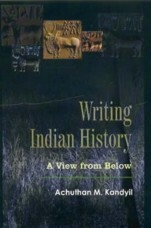 Arguing that the history written by professional historians has been strongly influenced by their concept of Hinduism, caste and its implications, or by an over-dependence on Marxism, and their upper caste status, Achuthan M. Kandyil urges that it is time that the counter view of the lower castes cannot be considered. Achuthan deconstructs the intellectual labour of iconic scholars and personalities like S. Radhakrishnan, M. N. Srinivas, Swami Vivekananda and Mahatma Gandhi, among others, to show how they supported the caste system, albeit condemning its excesses. Challenging orthodox interpretations, and more radical ones, Achuthan raises many key questions on what is history and how it is written.